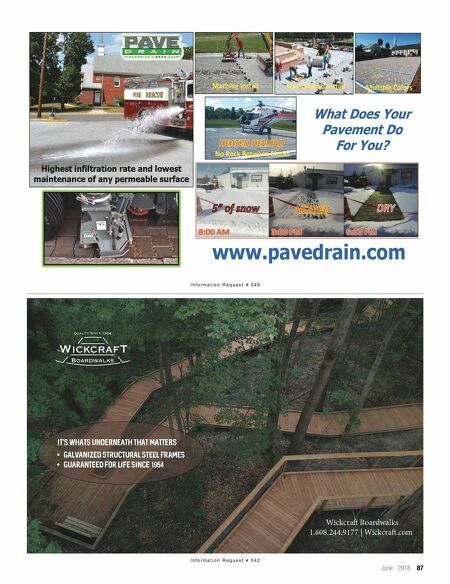 86 Landscape Architect and Specifier News I n f o r m a t i o n R e q u e s t # 5 3 8 The EPA worked cooperatively with the American Society of Landscape Architects, the American Society of Civil Engineers and the Water Environment Federation to host the 6th annual stormwater competition. The City College of New York and Kansas State University won in 2016. 2017 Campus RainWorks Challenge Winners The Environmental Protection Agency (EPA) recently declared the winners of the 6th annual Campus RainWorks Challenge, a design competition that pits colleges and universities from across the United States and its territories against each other. The goal of the competition is to have students and faculty members work cohesively in order to plan a sustainable green infrastructure system that reduces stormwater runoff pollution, somewhere on their campuses. 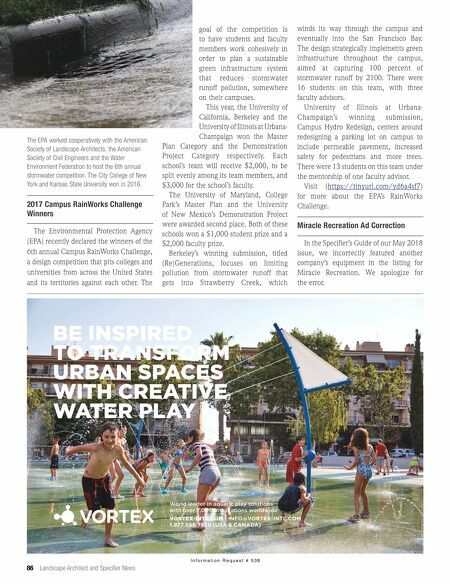 This year, the University of California, Berkeley and the University of Illinois at Urbana- Champaign won the Master Plan Category and the Demonstration Project Category respectively. Each school's team will receive $2,000, to be split evenly among its team members, and $3,000 for the school's faculty. The University of Maryland, College Park's Master Plan and the University of New Mexico's Demonstration Project were awarded second place. Both of these schools won a $1,000 student prize and a $2,000 faculty prize. Berkeley's winning submission, titled (Re)Generations, focuses on limiting pollution from stormwater runoff that gets into Strawberry Creek, which winds its way through the campus and eventually into the San Francisco Bay. The design strategically implements green infrastructure throughout the campus, aimed at capturing 100 percent of stormwater runoff by 2100. There were 16 students on this team, with three faculty advisors. University of Illinois at Urbana- Champaign's winning submission, Campus Hydro Redesign, centers around redesigning a parking lot on campus to include permeable pavement, increased safety for pedestrians and more trees. There were 13 students on this team under the mentorship of one faculty advisor. Visit ( https://tinyurl.com/yd6a4sf7 ) for more about the EPA's RainWorks Challenge. Miracle Recreation Ad Correction In the Specifier's Guide of our May 2018 issue, we incorrectly featured another company's equipment in the listing for Miracle Recreation. We apologize for the error.